Family Friendly Lake Front Property on the Water's Edge. Spectacular Setting. 2 bedrooms w/open kitchen - living -dining room space overlooking lake. Carver Cottage is only 20 ft from the water's edge and provides the infinity pool effect when sitting in the living room. You feel like you're surrounded by water - it's so close. The sounds of water splashing on the shoreline below lull you to sleep at night and during the day if you so please. Its proximity to the water with its spectacular views makes this unit special. This fully insulated year round cottage is so beautiful any time of year, you'll want to move to this quiet little oasis year round! Enjoy evening fires on the patio above the waters edge. Breakfast off the living room on the attached patio will be your dining room for the week if the weather cooperates. I can't say enough about the comfort of this house with its breathtaking western Adirondack views. Please call or email for additional photos and description of the property. 331 has one full spacious bathroom with all the amenities. Sandy bottom. Some rocks at initial entry. Ramp to doorway. Shower not accessible. This was a clean, comfortable home, right on the water. Privacy and views are wonderful, Owners very pleasant as well. And not far from the city or mountains. 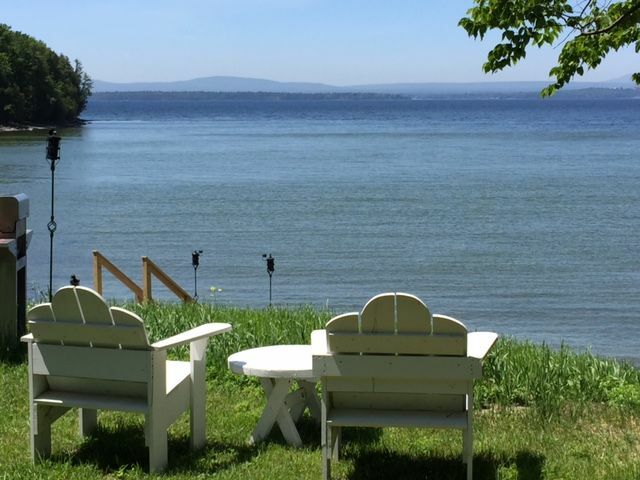 We rented 2 side-by-side cottages right on Lake Champlain for a family reunion. The 16 of us had a fantastic time despite unusually hot weather for end of August. There were fans in every room plus breezes from the lake. Kitchens were super well equipped. Cottages were larger than they looked on line. Beds were comfortable. The sunsets were memorable! The house and property was great. People and dog friendly. The only issue is the sulfur smell in water . I know they are working on this, The house is well stocked with everything needed and the owners are friendly and welcoming. Great house, plenty of room for 4 people and a dog with amazing views. Having an awning was great when sitting out in back and enjoying the views of the lake and the mountains. Great location on the bay with knee deep water and no waves/current. We visited plenty of local farms with blueberries ( they were incredible), apples, wine, eggs, etc. The only drawback is there is no air conditioner. There was one window air conditioner that was able to cool only the immediate area around it. There were a number of days that it was very humid and an air conditioner would have been very nice. Great cottage on the lake with a view! My family and I love it in the Carver Cottage. Perfect layout and right on the water. The cottage is on a beautiful, protected bay were you and your family can relax, play in the water, fish, or just relax.There is a stand up paddle board, a kayak and neat wooden canoe availbe to play with in the lake and my family has a great time paddling around. The scenery is great with the back of the house literally on the edge of the lake. You look out across the lake and get to see awesome sunsets over the Adirondack mountains every night. After sunset, you can lay down to the sound of the lake lapping the shoreline as the lake breeze cools off the cottage. It’s the perfect little cottage that sets my mind at ease the second I arrive. The “town” of South Hero is also a wonderful place with awesome scenery, great local vibe, and just enough local shops to keep you from venturing out too far. This was our second year at Carver Cottage and we plan to come back as often as we can! We really enjoyed our stay here. The space was much more spacious than what you could see on the pictures. The beds were comfortable and so was the huge couch in the living room! The sunsets were spectacular and it was nice to be able to sit out and enjoy the fire pit. The kitchen was fully stocked and the home felt clean. We did run into an ant issue, but the home owners were very responsive when I emailed and had someone come out to spray the next day. Also, the water is from a well and there was a sulfur smell, but it wasn't that bad in this house. Overall, we would absolutely come back and stay. We rented the other house also and it made for a nice extra space between both properties. The lake, the fire, the area was just amazing. $500 initial deposit is non-refundable. The remaining deposits are refundable only if the property is re-rented.